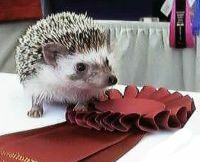 Dr. Debra is now a member of the International Hedgehog Association! “The IHA is a registered charitable non-profit organization established with the purpose of educating the public in the care and betterment of hedgehogs and to facilitate the rescue, welfare, promotion and care of hedgehogs everywhere. The International Hedgehog Registry is now a part of the IHA. We encourage Owners to register their Hedgehogs to help us better track health trends and hereditary traits. It is our hope that over time this will aid breeders in improving the quality of the species, and provide owners and breeders with lineage information. We encourage and support rescue through our rescue licensing program, ensuring quality care and placement of rescues throughout North America and Europe. As well, IHA sponsored funding campaigns help to keep hedgehog rescues running.